Available from Sandvik Coromant , CoroMill 170 high performance cutters are used for precision roughing of external and internal gears. 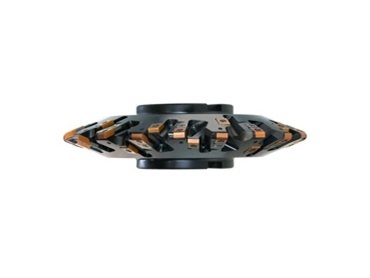 These high performance cutters are used for large gear teeth sizes ranging from 12-22, and will help to save time in gear machining applications. Measuring 210mm to 500mm in diameter, the cutter shape has been designed for a rough gear profile with small and even working allowance. These high performance cutters are capable of producing gear wheel profiles according to DIN 867 and allowance according to DIN 3972-4. More information on CoroMill 170 high performance cutters is available from Sandvik Coromant.